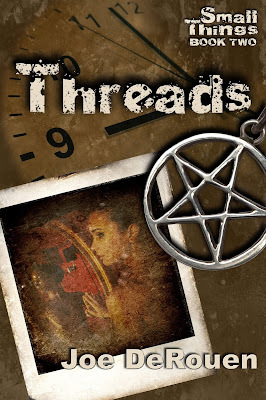 Threads, the second book in the Small Things trilogy, will be released on October 8th, 2013 – only six weeks from now! Threads will be available in trade paperback as well as various eBook formats. History is changing around nineteen-year-old Ben Spencer, and he’s powerless to stop it. His sister has disappeared, his family thinks he’s schizophrenic, and, worse yet, the girl he’s madly in love with won’t give him the time of day.Enter the mysterious Michael, who, years earlier, helped Ben’s parents defeat a powerful sorcerer bent on destroying them and reclaiming a relic stolen from him years before. With Michael’s help, Ben will travel back in time, to 1977, and attempt to set the past straight. But will be undue himself and the woman he loves in the process?